There are certain defensive players who just have a knack for being around the ball and UConn junior cornerback Jamar Summers certainly is one of those guys. Last year his interception return followed by Bobby Puyol's extra point provided the only points for the Huskies in a win over Tulane and he was back at it on Saturday. Navy was driving and in position to restore its two-touchdown lead in the third quarter when the Navy right guard Evan Martin ran right by 325-pound senior defensive tackle Mikal Myers in order to get to the second level of the UConn defense. Myers, who usually attracts at least one blocker on every play, was more than happy to have a clean shot at Chris High as he got the ball. Sean Marinan and Cam Stapleton quickly converged and the ball popped free from the Navy fullback. Summers failed to corral the ball on his first attempt but finally scooped it up and was credited with an 86-yard return for a touchdown. 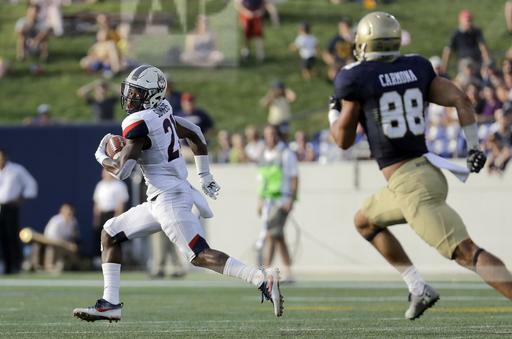 "Just make a play, whatever it takes," Summer said after the 28-24 loss to Navy. "Coach calls this team to fight for every inch and it is an opportunity to change the game. "I thought the play was going to be called dead but I didn't hear a whistle so I took the opportunity, picked it up took it to the house." I did some checking and Summers is in some pretty select company. First, it was the longest defensive touchdown by a UConn player since Darius Butler returned a fumble 86 yards for a score against Army back in 2005. It is also tied for the fourth longest defensive touchdown in program history. He is also one of 13 UConn players with more than one career defensive touchdowns. The list includes current NFL players Dwayne Gratz, Byron Jones and Darius Butler, former NFL CB Blidi Wreh-Wilson and former NFL linebacker Scott Lutrus. When you factor in Summers' 67-yard interception return against Tulane, he joins North Haven's Jeff DeLucia as well as former NFL draft picks Lawrence Wilson and Yawin Smallwood as the only Huskies with two defensive scores of at least 50 yards. He needs one more defensive score to tie the UConn career record set by DeLucia from 1997-99 and matched by Gratz, a current Jacksonville Jaguars defensive back, with a touchdown during the 2009, 2010 and 2012 seasons.